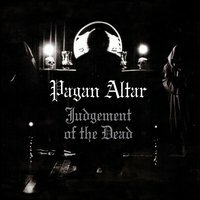 PAGAN ALTAR’s debut “Judgement of the Dead,” was originally recorded in 1982 but took decades to be released, finally seeing light of day in 2005. Much like their second album “Lords of Hypocrisy,” this album has been reissued with a fresh new digital remaster. I also reviewed that second album, and as I noted in the review, I am ashamed I am just now hearing of this classic Doom band. The album begins with the eponymous track, a seven minute long rocker which combines perfectly the elements of NWOBHM and Doom. The song really gets moving after the 2:34 mark, the band settling in to a large fluid movement where they turn into one big rock and roll machine. The second track, “In The Wake of Armadeus,” is one of the shorter tracks on the album, a tightly focused song with catchy vocal melodies and guitar solos that piece together the best parts of the song. Mizrahi’s drums are particularity flashy here especially when backing up the guitar solos. “The Black Mass,” has to be one of the heaviest song from this era; as dark and brooding as anything BLACK SABBATH has done. The riffs are super thick, made up of heavy crunches that are made all the more strong with Protch’s bass lifting them up. The final track, “Reincarnation,” is the epic of the album. The beginning moments are filled with stellar musicianship from Protch and his melodic bass. ALAN’s guitar is clean but intricate, weaving a web of acoustic riffs that push the song to its heavier parts. From around the six minute mark to the end, he lets it all hang out; he throws out solos, solid riffs, and an impeccable sense of how to put together a song from riff to riff. In the end, this is a great debut and a classic for Metal in general and Doom in particular. However, it isn’t quite as strong as their second album, “Lord of Hypocrisy.” The production is slightly messier, although the rawness of a debut, especially from this era, is somewhat expected I suppose. Terry’s vocals, while in fine form, aren’t as refined and confident on this one. The same goes for Alan’s guitar playing which lacks some of the adventurous qualities he would display later on. However, much like their second album, this is a must have for fans of the style and a great piece of Doom Metal history.